This picture as you can see, has more then just the pork chops. 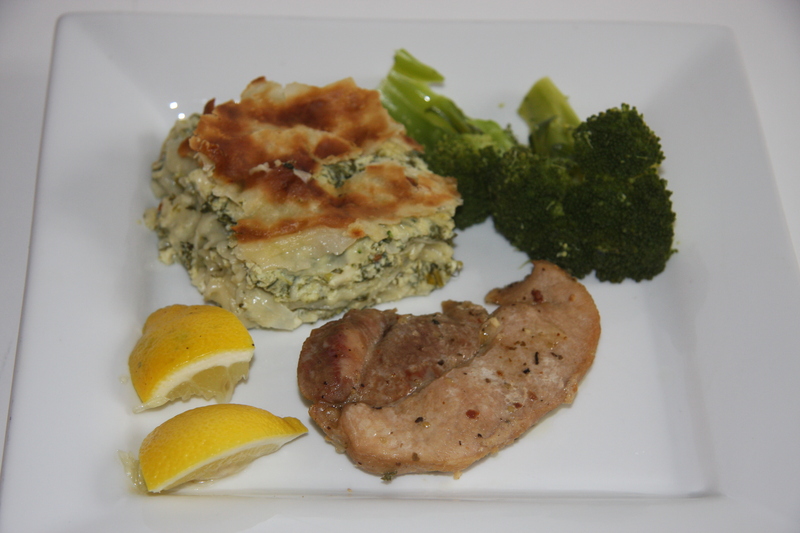 The item on the top left is my spanakopita, which is also posted in my blog, on October 3, 2014. It is an absolutely fabulous recipe.The pork chops are very simple to do and can be cooked a number of ways. I originally started with the idea that I would BBQ these. As the day progressed and things started to get a little hectic, they ended up baked in the oven. Very simple to do them this way. Put them in a pan, cover and bake. Doesn’t require much thought and for me, there are days that I relish doing things without thinking. Sometimes I believe thinking is overrated. Anyway, here is the recipe. In a jar add 1-1/2 cups of olive oil, juice of 1 lemon, 1 tablespoon Greek spices, (they come in a spice bottle labeled that way), 2 cloves grated garlic, 1 tablespoon salt and about 1/4 cup of water. Mix well. 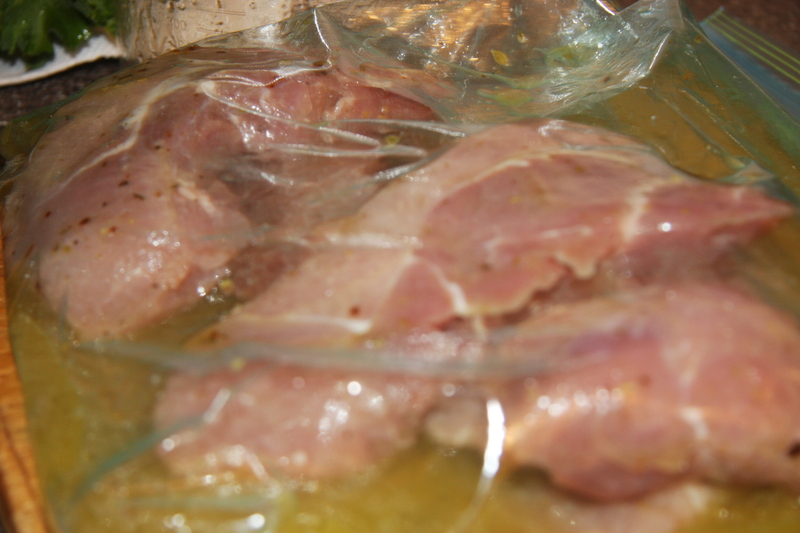 Take the pork chops, place them into a zip lock bag and pour in the marinade. Refrigerate for at least 2 hours or overnight. 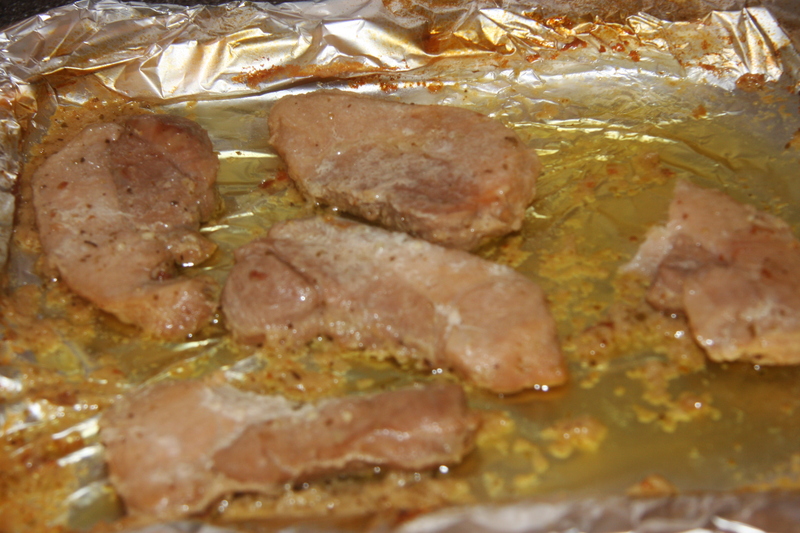 Place into a foil lined pan (for easy clean up), along with marinade, cover with foil and bake for 40 – 45 minutes. All depending on the thickness of the pork chops you may have to bake or BBQ them longer. Serve with a veggie, rice, or my spanakopita. So simple. Mix together oil, spices, garlic, parsley, salt and water. 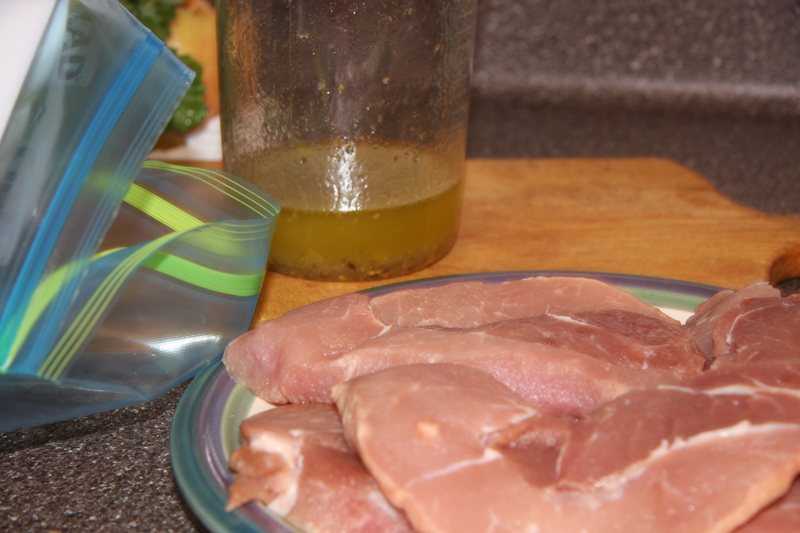 Into a zip lock bag place the pork chops and the marinade. Refrigerate for 2 hours or more. Place the chops into a foil lined pan along with marinade and bake for 45 minutes depending on thickness of chops. Or BBQ until no longer pink. I don’t know what to say except make it.